Finding the supply outpost occupied by less than normal residents, the Marines are soon fighting for their lives against a deadly force unlike any they've seen on the battlefield. It'll take all their training and skills to get out alive, let alone in one piece. I love Jake Bible. I always enjoy his writing style and his books are always a great read. This was dark and grim. Just how I like it. Really enjoyed it. Andrew Wehrlen is a wonderful narrator. I always enjoy his performance. 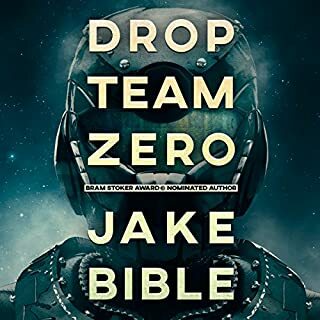 When a squad of Galactic Fleet Marines decide to do an opportunistic heist, they think it will be an easy smash and grab, but things go wrong and they are forced to run for their lives. 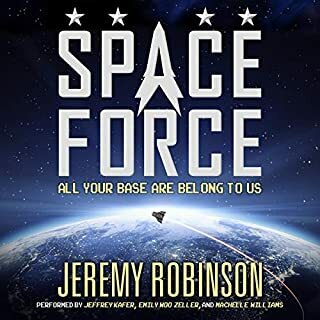 The only escape is an unstable wormhole, but crossing through has some devastating results for their ship, and the are forced to check out an abandoned supply outpost, on a hostile planet. Upon arriving there, they find out that the place isn't as abandoned as it seems. This was a bit of a slow burner, but I still ended up enjoying it. The plot was enjoyable and had steady pacing, which ramped up when the fighting started! There were a few twists that I didn't see coming but overall, I had an idea of where the story was going. Still it kept my attention till the end was entertaining!! The characters were all well written and developed and I enjoyed reading about them. They were easily likable and you can't help but root for them. I also enjoyed the A.I's and the.... things that are on the planet. It was a unique take on things. In all, it's a good entertaining story. The ending wrapped up nicely, yet there are possibilities still there where a sequel may take place. I, for one, would definitely read another book with these characters. I thoroughly enjoyed Andrew B. Wehrlen's narration. He had plenty of tones and voices and read the story well. He was a good fit for this and I look forward to listening to more by him. Jake Bible and Andrew Wehrlen deliver a new chapter in a sci fi galaxy that rivals Star Wars in depth and breathe (expanded universe not Disney created universe). A host of worlds and aliens that populate them, galaxy spanning Wars, crazy tech, A.I. 's, and a gritty realism to the characters that is difficult to find. Love every tale of this sci fi opera that I've had the pleasure of reading/listening to. Highly highly recommend any and all of them. I was voluntarily provided this free review copy audiobook by the author, narrator, or publisher. This book was really good! It was action packed and really funny at times. I couldn't believe when it was over. I hope there will be more books about these characters. Although, the warped marines were my favorites, especially Chick. As I was listening, I would rewind certain parts to listen again because I was laughing so hard. Don't get me wrong, the book is not full of comedy. I just though the parts with the warped marines were hilarious. All in all, a great read! Too many characters and none of them took the lead. I felt that if he would have focused on one character a bit more to make it the lead the story would have been a lot better. It took a couple chapters for me to get into the story, but once it got going it was a very fun read/listen. Plenty of action, some good laughs, and a unique desolate outpost idea. Good use of The singularity too. This genre of book is not my typical fare, but I was attracted to it by the synopsis provided - a group of space marines, a simple heist? What could go wrong? Things turn to muck pretty quickly. The group find themselves stranded on an uncharted planet; beaten and seeking help only to find themselves worse off than before. The story line is solid and well paced. The characters are well defined and likeable. The environment harsh and well structured. The plot was complex enough for me with enough twists and turns to keep things interesting. I certainly didn't work out the end game before the author was ready to tell me. Most depressing, but refreshing, was that the book doesn't offer a necessarily happy ending. Without spoiling the story, not everybody makes it to the end! Even nice guys die. The book is well narrated by Andrew Werhlen who keeps the pace nicely throughout. All round, this is a great story and very much worth listening to. 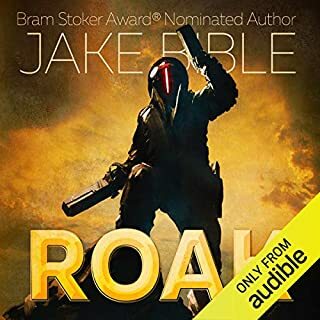 Finally, I would like to thank the Author/Narrator/Publisher for providing me this book through Audio Book Boom dot com in return for an unbiased review, for which I am very grateful. 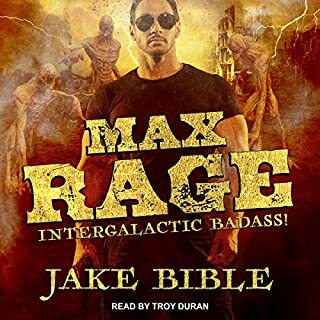 I'm not familiar with both Jake Bible's books, but have indulged in other works narrated by Andrew Wehrlen, which prompted me to give this a chance. Andrew has a commanding voice and varies tone for the characters. As another reviewer pointed out, he has a talent to glaze over the continuous stream of "said". Outpost Hell was a futuristic military sci fi horror? Again, not a theme I usually drool for or support, but it kept my attention and was written rather well for my novice naiveté limited knowledge to folow along and enjoy. The characters were well grounded and developed. Another carrot dangling in front of me, to entice me to stay with it. The unraveling of the secrets of the planet and the climax was very satisfying. This author has mostly zombie series under his belt, which I usually avoid like the plague - or undead virus. BUT this narrator seems to have teamed with him on several other books. I would recommend this book, with the AI, its 'not leftovers for dinner' and electrical storms. Good book but depressing since some of my favorite characters didn't make it. I received this audiobook for free through Audiobook Boom for my unbiased review. 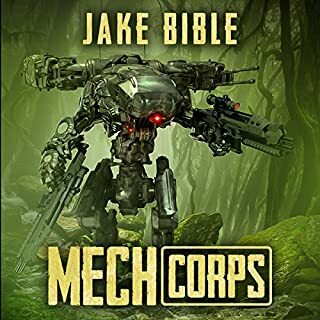 I would recommend this book to a friend indeed, in fact I have .Jake Bible blew me away with this book. 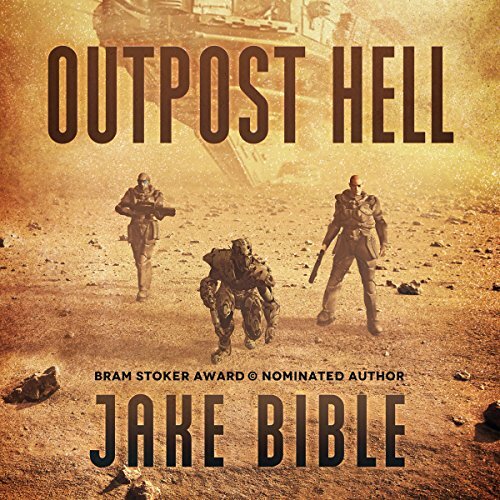 Other reviewers have likened Outpost Hell to Star Wars and I couldn't agree more.It was dark and gritty with no unnecessary sparkle.Its a horror Sci fi story and it stayed purely that throughout the book.What the marines go through grabs you and adrenaline and the fear for the characters we have grown to know is almost palpable ,Andrew Wehrlen makes absolutely sure of that . 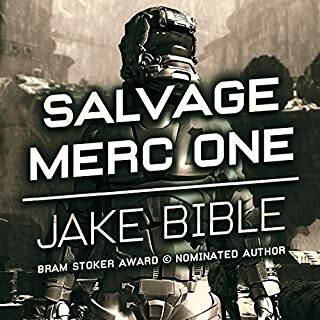 The detail regarding the skills and battle tactics or the marines are unbelievably detailed ,you could almost feel like you are there.I have never read any thing by Jake Bible before or listened to anything by Andrew Wehrlen but I wouldn't hesitate to again.Blood,guts,soul wrenching pain and terror,amazing Tech and A.I s .This book has it all.This is not a feel good book this is a book with loss and heartache but that's war and this...this is Outpost Hell. "You're done, stone boy, done forever." Andrew Werhlen reads this innovative story to perfection. Each character has his or her own individual voice, the pace is brisk but not too fast and his changing intonations help ramp up the tensions inherent in the text. I especially enjoyed his rendering of the drop ship's A.I., blandly smug and happy. He even managed to mostly hide what could be an irritating glitch in the transference of written word to the audible: the Saltzi-like off repeating sequences of, "he said, she replied, they answered" and the like during longer patches of quick fire conversation. Characterisation is good and I really cared for the Marines caught in the turmoil of battling for their lives against the ... Guess you need to get the book to find out who. I was really fortunate in being gifted my copy of Outpost Hell by the rights holder, via Audiobook Boom. Thank you: I really loved it. An heroic A.I., fabulous fights, delicious dialogue, crazy characters, great narrative and narrator - what more can any military s.f. fan want.